if Google amputates, we transplant! The more I think about it, the more I believe that the links I bookmark everyday are an important dimension of my online life. In late 2011 Google »integrated« several of its Reader's features into GooglePlus. Those features became useless after what we feel was an amputation of vital parts. We mainly missed the sharing goodness and as it happened, we were looking for Google alternatives anyway at that time. Share any page you are browsing with a simple, intuitive bookmarklet, even though you're not subscribed to the website's feed (it might not even have one). See the screenshot above for an example. To show the non-tt-rss-using world what you share with other tt-rss-users, gritttt-rss provides a widget that shows the latest items from tt-rss' public shared feed on your website (examples can be seen embedded on the lower right on both Nic's website and Jan's website). In order to make the move feel like Google Reader never happened, gritttt-rss lets you import your historic starred and/or shared items from Google Reader into tt-rss. 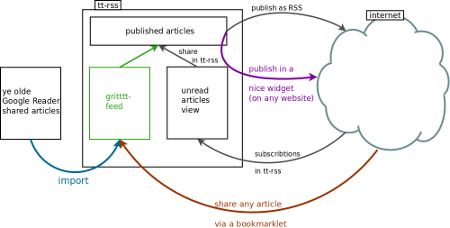 google reader inspired transplants to tiny, tiny rss,	which you can find and follow on github. There, you'll also find installation instructions and examples. We hope you find it useful and enjoy it, too. Let Nic know what you think or fork on github. Where to go next with this? The more I think about it, the more I believe that the links I bookmark everyday are an important dimension of my online life. I bookmark a couple links everyday, and years later I can look back and understand what I was interested in during certain times. Unlike online services like Delicious or Pinboard, however, the user hosts the list of bookmarked links him- or herself - (s)he really owns the data. And the method (the gritttt-rss code) is open-source. To make gritttt-rss work, we have used tt-rss as the vehicle of choice. It hosts the list of bookmarked links in its database and via its RSS-subscriptions, it provides a very convenient method to bookmark links (via sharing or starring). 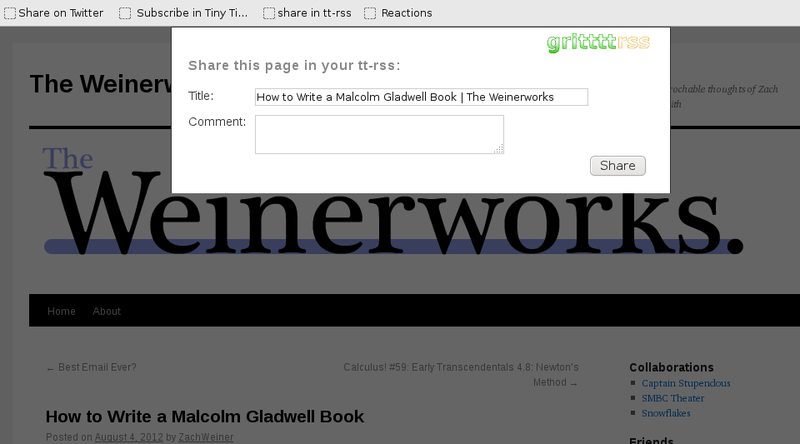 Basically, we only added the feature to share any other website you're browsing on. However, gritttt-rss could also be independent of tt-rss - it could do its work of building up a self-hosted list of bookmarks using other software (e.g. a different RSS Reader) as vehicle, or even write only to an archive of plain RSS files.